Reconditioned Golf themed pinball table! Teed Off is a sports theme that was released by Gottlieb in 1993. This fantastic golf based game was a huge draw in sports bars and pubs, and was a big hit thanks to features including 3 x Flippers, 3 x Slingshots, 2 x Bullseye Targets, 4-bank targets, a captive ball spinner below the centre of the playfield - the "Gopher Wheel" - and Gopher voice sound effects. Please note that this is a stock photo and may not fully represent the quality of the graphics. 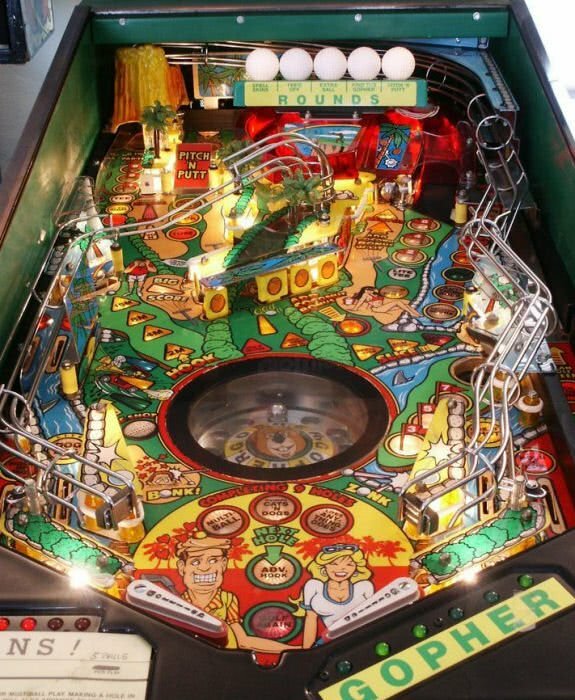 Teed Off was originally released to the arcade, public house and amusement trade industry in 1993 and was a huge hit. This product is delivered & set up by a two man courier (please see restrictions for Scotland) to a ground floor location as standard. Please see below for further delivery details.